What are wireless call systems? In which industries can wireless call systems be used? Wireless call systems is the new easy way to communicate with your clientele. 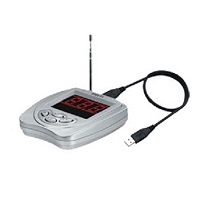 These systems consist of transmitters and receivers. The systems are wireless, so you don’t have to worry about them malfunctioning when there is a power-cut. A wireless call system is also easy to install. Transmitters include different types of call buttons. There are also different types of receivers, catering for different industries. Let’s see which industries will benefit from having a wireless call system in place. Any industry would benefit from using a wireless call system. Some industries I will speak about include hospitals and retirement homes, restaurant and take-aways and supermarkets. Every hospital or retirement home should be equipped with a wireless call system. The system could serve as a communicating device between the patient and nurse. The call buttons are wireless and waterproof, so they can be mounted to the bed-side, and in the bathrooms and showers as well. In case of an emergency, the patient will feel secure that a call button is always within reach. Call buttons can also be put on a lanyard, and worn around the neck of the patient. There are many receivers that the nursing staff can use. The nurse can use a wrist watch receiver, so that she can respond to call requests while on the move. There are also different types of display monitors that can be placed at the nursing stations. These monitors have settings which can be adjusted, depending on the preference of the hospital. LED lights can also be placed above the doors of each patient’s room, and will flash and beep when a call button is pressed. Nursing staff can also use a wireless call system to get hold of doctors at the hospital in case of an emergency. With our wireless call systems, the response time of the nursing staff is monitored, ensuring that nurses respond promptly to patient’s calls. At retirement homes, the same wireless call system can be used. Residence can have call buttons mounted to the bedside, bathroom or shower, and can also walk around wearing the call buttons around their neck on a lanyard. Nursing staff or care givers at the retirement homes can use wrist watch receivers, or have display monitors placed around the retirement home. There are many advantages to having a wireless call system in place at hospitals and retirement homes. The biggest advantage is, having these systems in place will actually help nursing staff save time and lives. We all have had the experience of going to a restaurant expecting to have a tasty meal and great service, only to find ourselves constantly calling out to waitrons or waving for assistance. Having the wireless call system in place eliminates all the hand-waving and calling out for attention. Restaurants can make use of a wireless call system called the waiter call system. 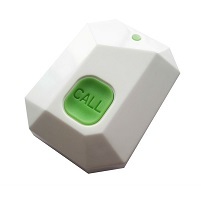 This system consists of a three key call button, which is placed on each table at the restaurant. The keypad consists of three buttons. 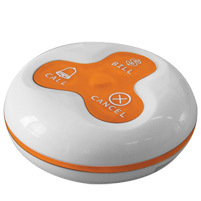 A call button, a bill button and a cancel button. When pressed, the call button will alert the waiter, that a particular table needs assistance. The bill button can be pressed, requesting the bill. The cancel button will be pressed by the waiter when he reaches the table, thus cancelling the call request. Waitrons can use wrist-watch receivers, so that they can respond to patrons while on the move. Display monitors can also be placed in the restaurant kitchen, displaying notifications. For take-a ways, the wireless call system also has a guest paging system. Once the customer orders from a take away, they will be handed a pager. The customer does not need to stand in line and wait for their order. When the order is ready, the take away, using a guest paging keypad, can page the customer, alerting them that the order is ready for collection. Alternatively, instead of handing out guest pagers, the take-away can have a display screen, displaying the order numbers of orders that are ready. The advantage of having a wireless call system in place at a take-away, is it minimizes disorder in the queue. Supermarkets are always busy, and sometimes it can be difficult for staff to keep track of things and communicate with management. We offer a queue management system and a counter paging management system. In the busiest of times, it is difficult to manage queues at the supermarket. That’s why having these systems is of the utmost importance. The Queue management systems can be used to help with the flow and efficiency of the queues. The counter paging management system consists of a button that is placed at every till point. The tellers can press this button should they need assistance. Managers can have wrist-watch receivers so that they receive notifications while on the move. Alternatively, display monitors can be placed in the management office, displaying a notification when a teller needs assistance. The advantage of this is that tellers don’t have to make customers wait in the queue while they request assistance from management – assistance can now be requested at the press of a button. No matter the industry, having a wireless call system in place will ensure great communication between staff members, as well as their clientele. In this article, we have discussed using a wireless call system in different industries, and have stated the benefits of having a wireless call system in place.